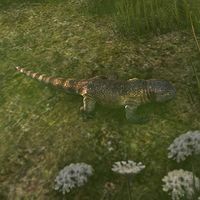 The Copper-Tongued Skink is a lizard which can be found hiding in Ogre's Bluff, Alik'r Desert, though it is usually found in the Murkmire. The skink escaped its' trainer, Arlowe Viducia, who was training it for Jee-Lar and the Cyrodilic Collections expedition. This particular species of skink is renown for their strong constitution and taste for anything poisonous, thus these lizards can be trained to specifically sniff out anything poisonous and eat it. This page was last modified on 11 October 2018, at 02:06.